Cook Success® Brown Rice in boiling water or microwave according to the package. Mix rice with lime juice and cilantro and place in large serving bowl. 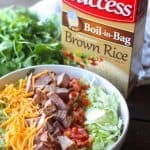 Layer rice with meat and taco fixings.